What kind of an idiot would dissect ten George Brett rookie cards and paste them onto the outside of his baseball-themed “Valentine’s Day” box at school? I suppose it depends on whether or not that idiot was a primary grades student or not. A kid that would do such a thing is either really into the Royals, or really a bit twisted. I’ll let you decide that, but I’m glad the hobby of collecting baseball cards never really entered the “business” realm for me like it did for so many of my friends. If it had, I’d really curse the day I made George Brett and Frank White into Valentine’s wallpaper. Sad. I’m a lucky guy. Period. Honestly, after getting the call that I’d been selected as a member of the first group of eight for the event, I began to wonder how I was even picked. After all, this is certainly not a sports blog. My Twitter feed is also rarely used to banter about sports-related things. In fact, I learned a while back that tweeting play by play details of the Missouri State Wrestling Championships tends to irk edu-followers. Shortly thereafter I created a spinoff “ANGRYREDBIRDS” account for such things. I briefly wondered if I should do something similar for Blog 2 The K. In the end, I decided not to go that route. In fact, I began this blog with the same, “let’s see what happens if I push this button,” mentality that encouraged me to attempt an application for Blog 2 The K in the first place. I came to this space in 2008 as proof-of-concept that blogging about one’s passions in life could be a transformative learning endeavor. I was betting that, if implemented well, recent changes in social media could add value in today’s schools. Social tools like these are what you make of them, but I believe deeply in the power of amplifying the voices of our youth. For me, personally, over the past three years this blog has truly become a hub for my personal learning. I’d really love to be able to post here more frequently. Doing so does good things to my brain. Nashworld has become a bit of a portfolio of the thoughts I synthesize, a collection of ideas in which I believe, a summary of the projects I’ve been a part of, my overarching reflections on learning in general, and ultimately my attempts to share it all. Embedded within these threads are a good many of the things I am passionate about. In the spirit of full disclosure, I have to admit that a significant part of my application for Blog 2 The K, included the fact that I have truly fallen away from baseball in large part since “the strike.” Yesterday, I paid a rare visit to the attic. I drug out a massive plastic bin and rummaged through the contents to take the photo posted above. A few things are pretty obvious from that assembly (other than the fact that I still cling to one last Brett rookie card). 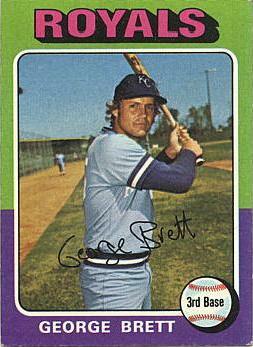 Like many near my age in the KC metro region, I looked up to George. I’m sure I always will. Among the countless other games of my childhood, I was there late in the season in 1980 to see his batting average peek back above the .400 mark, I was there to see his last home game as a player, and more. Perhaps it’s the story that I missed. Perhaps, even more than timeless statistics, what baseball fans are after is story. I played baseball as a kid from age six until high school. 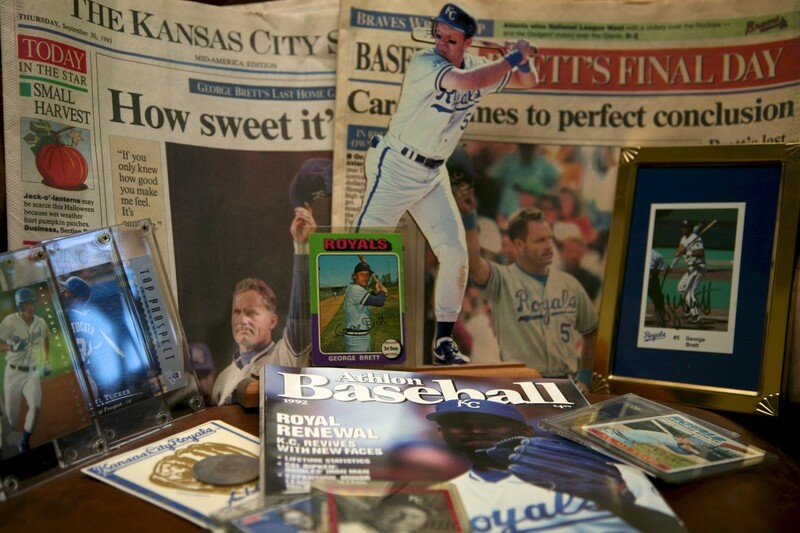 Looking back the past few days, perhaps more than baseball itself, I came to deeply admire the public character of guys like George Brett, Frank White, and others. Though we’ll likely never get stories like that again, I was at one point excited anew about the youth resurgence in the early to mid ’90’s. Sadly, we lost those guys in a a fire sale. At one point in the past decade, I tried to get back on the bus once again for a year or so, only to be disappointed again. I certainly don’t need wins… but I need story. And for me, it’s become clear to me that those stories must include some pretty deep character. Fast forward to this morning, and I have to say that I am really fired up about tonight’s experience. I am ready to soak it all in from the first minute to the last. I am ready to let this current passion attempt a reconnect with an old one… one that still wears red stitches on white leather. I’m excited that the Royals organization is getting into the game game of social media. There is a ton of individual passion there to harness. Who knows, if the world can have an Arab Spring thanks to social media, maybe… just maybe we can have a Royals Spring. Maybe this Spring will launch the lasting stories I’ve missed all these years. Clearly, you were selected because you’re a good writer. Enjoyed the article. I look forward to meeting you tonight. Good luck. I’m smiling as I read your post this morning. Lonnie still mourns the pre-adolescent “If I only had a brain” card activities that took out his Nolan Ryan collection. Have yourself a wonderful time my friend. You are well deserving! You’re a Royals fan?? I didn’t think there were any of us left! We just went to the game on Monday, and even with the horrible ending had a wonderful time at an incredible stadium. Have a great time!